Jocelyn Hoffman spoke to the media, with Mark Butler MP. “This will go a long way to improving the capacity of the aged care sector to attract and, importantly, retain the quality, dedicated aged care workers that we need. “It won’t close the wages gap between public and private hospitals and the aged care sector, but it will go a long way to improving outcomes for our members in aged care. 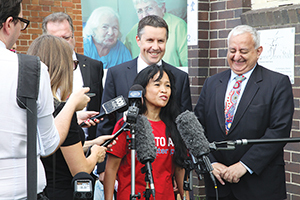 “It will make a big difference to all the nurses who work in aged care and look after our elderly. There will be more nurses coming in, staffing will increase and there will be better care for our elderly. “For the first time ever a federal government has dedicated money to aged care workers and has tied it to enterprise bargaining so we are assured that nurses, AiNs and ancillary workers can get an increase in wages.